Love is Everywhere: We all need a haircut. On the left is the BEFORE. The two photos on the right side are AFTER. So I did it. I went out and bought a set of clippers so buzz Peanut's little 9lb body. 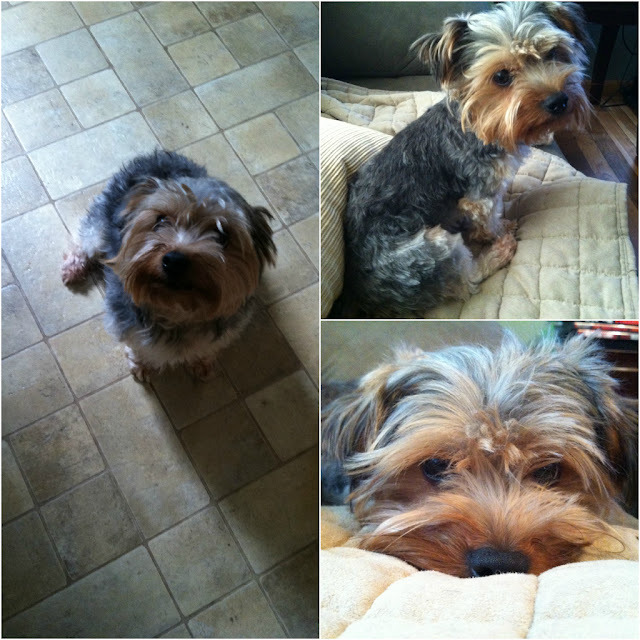 He's so fuzzy and since Yorkie's don't shed, he accumulates so much hair and knots. I couldn't deal with it anymore so instead of cutting to give him haircuts with scissors I took a chance. I plopped him in the bathtub and buzzed away. I never saw so much hair. He's now more comfortable and I love petting his crew cut back and nub little tail.